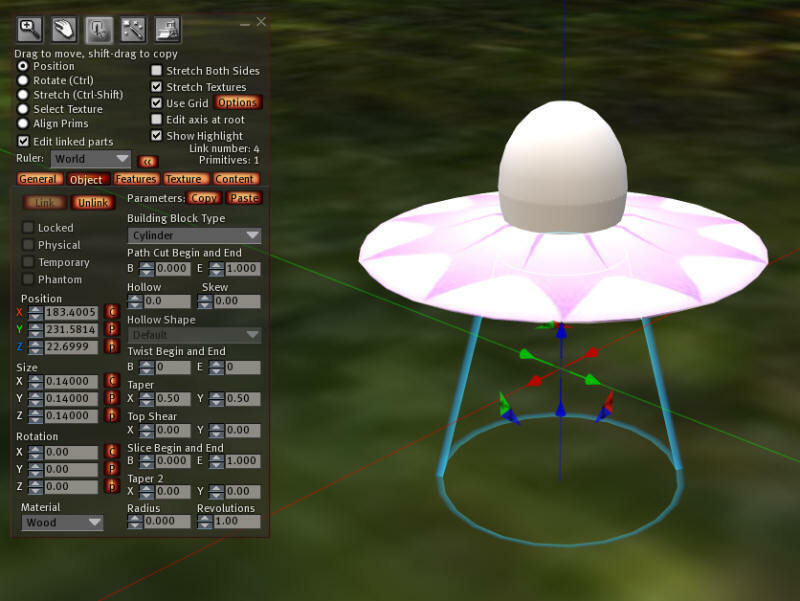 This is Part 6 - Making a spaceship transport crate for a breedable pet robot in Second Life. Your Troubot Robots cannot live in your inventory. They must be carried in a special spaceship crate. A spaceship crate is set of prims with a script and a copy of the nut and bolt and the Troubot Robot in it. Transport spacehips should be given out for free. Each will carry one Troubot Robot. 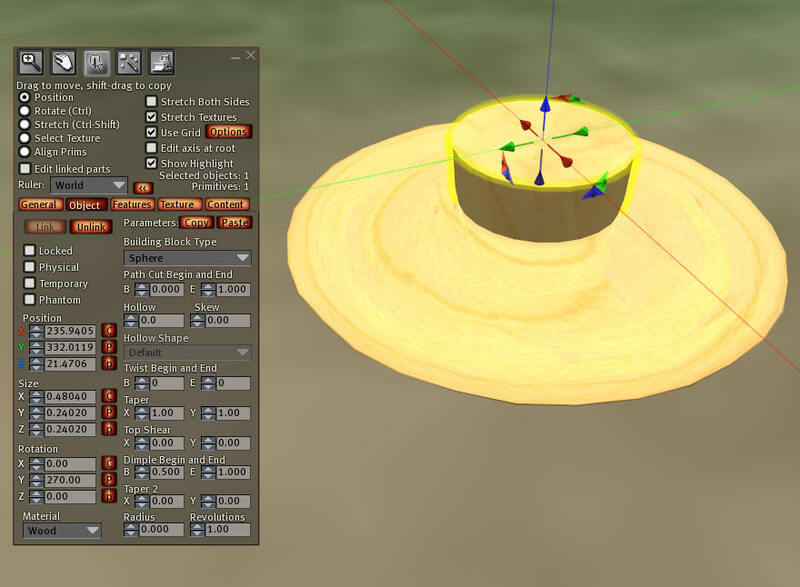 You can make a simple crate form a simple cube prim. Just add the script xs_cryocrate to a cube. Set the Global variable BOX to TRUE and you are finished. Name the crate "Transport UFO" and you are done. And that is sooo boring. So lets make it into a spaceship! 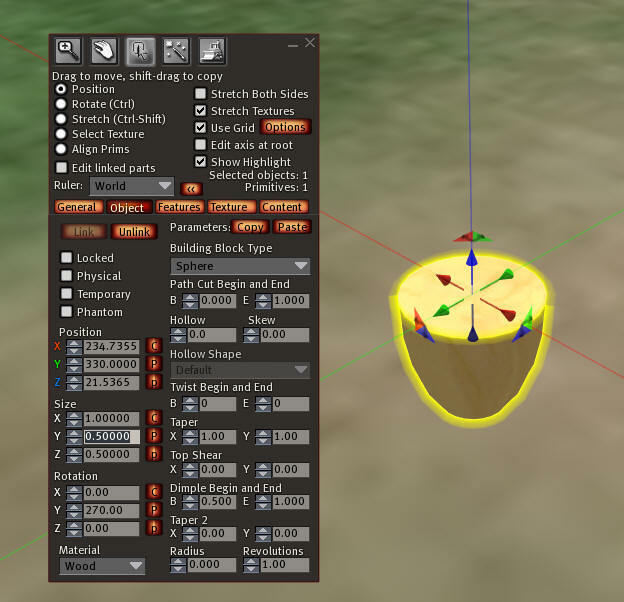 Rez a cube and set it to type = 'sculpt'. Position this over the Spaceship and size it to fit inside the dimple. Make sure that some of the half-egg shows above the spaceship, as it will show the one of the colors of the breed. Now shift-copy the egg and flip it over to make the second half. Color both the eggs blank, or white. 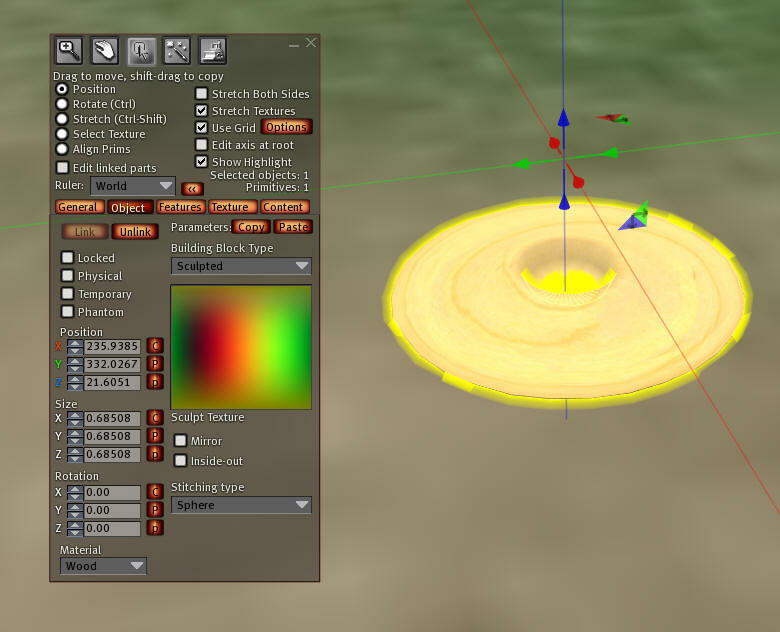 Add the UFO particles plug in script and the "Rotate the Teleport.lsl" script. The cone should start spinning rapidly. Now make the teleport beam 100% transparent. The script will change this later to visible. 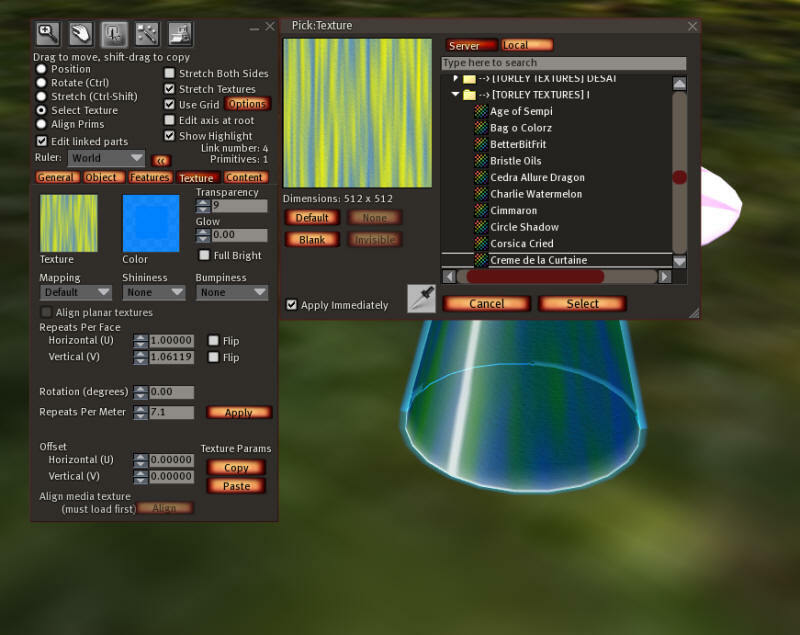 Select all the part and select the invisible base last, and then press ctrl-L to link them together. If you want to add any special effects, not is the time to do it. Put a copy of the "Nut and Bolt" and "Troubot" from your inventory in the spaceship crate. Put a copy of xs_cryocrate in the spaceship beam. Put a copy of the rotate script in the spaceship beam. Put the "Beam Particle Effects" script inside the invisible 'beam' prim. Now you can select which two prims will be changing color by changing the description of the child prim to 'color1' and 'color2'. 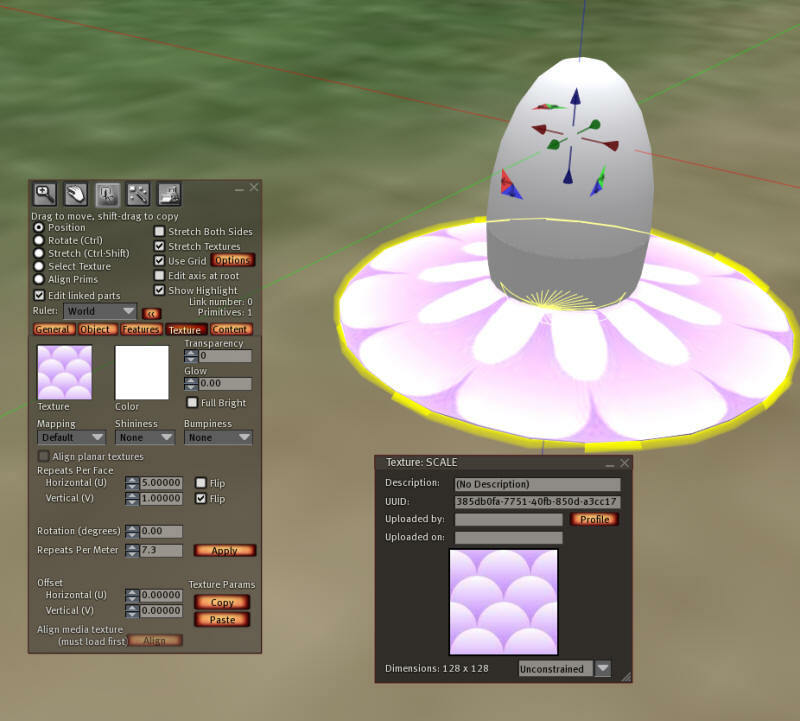 For the simplest version, set the egg top and egg bottom to a description of 'color1' and 'color2'. Now you can take a copy of it back to inventory.